Icy mountains hold danger and death. The wizard Alstera continues her quest to restore access to her bound powers. A nightmare of foul sorcery gives her an opportunity. She tracks the evil to a snow-smothered village deep in the mountains. A vengeful woman wielded spells based in sorcery. To fulfill her revenge, she re-animated a corpse, turning the dead man into a death-walker. When Alstera and her friend Raul arrive, the suspicious villagers don’t trust them. Too many have died mysteriously, victims to a monster that don’t dare name. Alstera is shocked when she discovers the sorcery re-animated a corpse. Walking Death drinks blood to retain a semblance of life. But to fight the death-walker, she must once more rely on primitive and forbidden blood-magic. With her powers bound, she had to use blood-magic in Vaermonde (Dream a Deadly Dream). She wanted to avoid another use. She wanted an easy battle against sorcery. Yet this battle isn’t easy. She can’t find the sorcerer. She can’t find the death-walker. And a wizard from the Enclave is in close pursuit. or if she is crossing the tenuous barrier that separates wizardry from sorcery. Every time she uses blood-magic is a mark against her. If he returns her to the Enclave, the wizard council will strip away all her powers. Then Walking Death claims his re-animator as a victim. With only a small portion of her powers freed, not enough against the death-walker, can Alstera wield blood-magic to defeat a blood-spelled monster? 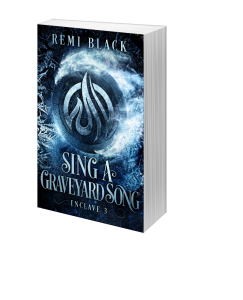 Remi Black’s Sing a Graveyard Song is available now, exclusively on Amazon.